Your child has just fallen sick and everything feels like it’s falling apart! You rush to the doctor and get the required prescription to help your child get well really soon. Along with giving your child his/her required medication, you need to keep track of his/her medication for documentation and recording purposes. Keeping a child’s medication tracker will help you to keep a record of his/her medication, the dosage, the time along with if there were any symptoms at the time of medication. Keeping a child’s medication tracker will help you in deciphering better if your child is responding well to the medication or not and would give the pediatrician a better know how of what diagnosis to give your child. The child’s medication tracker needs to be divided into various columns where the first one indicates the time and the date. This helps in recording the time period of the medication. The second column should be dedicated to the name of the medication given to the child and the column next to it should mention the dosage of that particular medication. The final column can mention if there were any symptoms like a fever or you can take down notes regarding the condition of your child’s health. 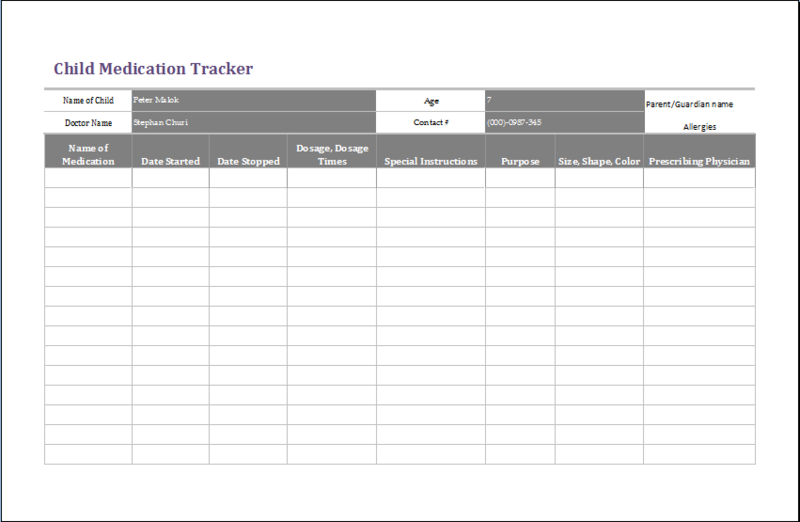 The child’s medication tracker can be used as a template for future uses as well. This tracker can also be filed in your child’s medical file as well for future use and for the doctor’s knowledge as well.